I recently acquired a beautiful Gräfenthal Stagecoach antique figurine #13842 from a flea market for $10 in Central New Jersey. I'm an amatuer at this and wanted to know if I got a good deal? The seller has more of these Grafenthal Figurines but I only purchased this one. 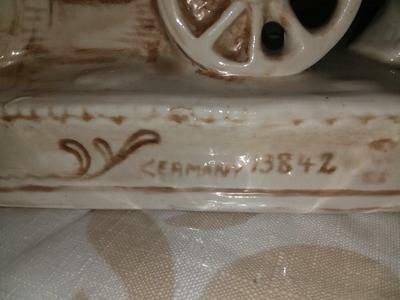 I am having conflicting reports on where the figurine origins from (Seller said Germany). I have been told Dresden, Carl Thieme. 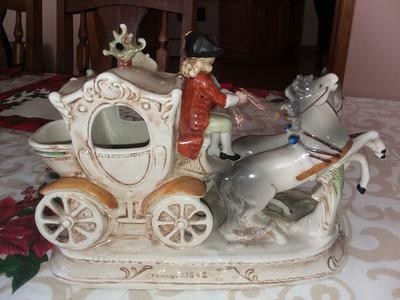 Also he tells me this figurine is from the 1800's and I did some research and I think it's from around 1950 t0 1970's. Any and all help would be greatly appreciated! It has markings underneath as you can see in my photo's. 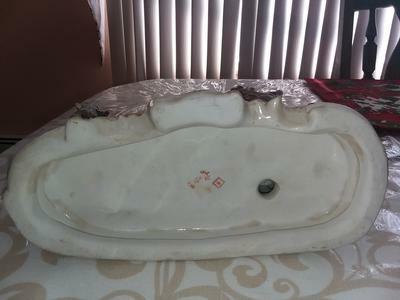 It is a beautiful figurine in immaculate pristine condition, no cracks, no sharp edges and no missing pieces. I want to go back next weekend to buy the whole lot of approximately 20 Grafenthal figurines but need to know from someone with more experience if these are legit? Every figurine that he has is in excellent condition! Some of the Grafenthal figurines have different colored markings on the bottom. I think this would be a great deal of $300 for the whole lot, just want to make sure they are truly the real deal. I will be listing the stagecoach on my ebay page avapotato. Once again I would like to thank anyone and everybody in advanced for any and all help with this figurine. 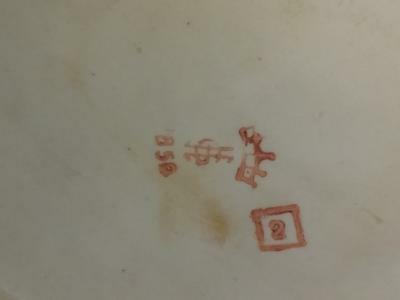 I can help you more accurately identify and date this mark. This is the mark of Carl Schneiders Erben of Gräfenthal, Thuringia, Germany (mark used from 1886) - not Carl Thieme, Dresden. The thinner more detailed mark was used after 1951 when the company was renamed simply 'Gräfenthal' after the city within which it was located. The mark above is indeed the older mark, first used after 1886. I am tentatively guessing therefore that this item is c. late 19th century or early 20th century. I'd have to do some specialist auction report research to get a handle on the price - which takes quite a bit of time. I tend not to do this type of research for free as it is a commercial activity. Feel free to book my evaluation report service . . .